A traditional priority for hotels has been to please and satisfy their clients with the clear objective that the client returns to the hotel on his next visit to that particular destination. However, what hotels have barely done is incentivise clients to book with them directly the next time they come. This lack of initiative has put on a platter to intermediaries not just customer loyalty to the hotel but also customer loyalty to their channel to make the bookings. To this day, OTAs don’t waste any time and after clients check out of your hotel, they send them customer-loyalty emails which, we fear, are not always about staying again at your hotel but rather in any of the ones available on their channel. For them, the priority is to build loyalty to their channel. The fact that they return to your hotel is secondary in the best of cases. Once again we come across a conflict of interests between the hotel and the distribution. You want your client to return to your hotel by booking through the direct channel and the intermediaries, instead, want their upcoming bookings to be through their channel. Which hotel they book is pretty much irrelevant. Acquiring a client who doesn’t know your hotel is really complicated and increasingly expensive. This is where OTAs really provide some value, since they showcase your hotel to the world. 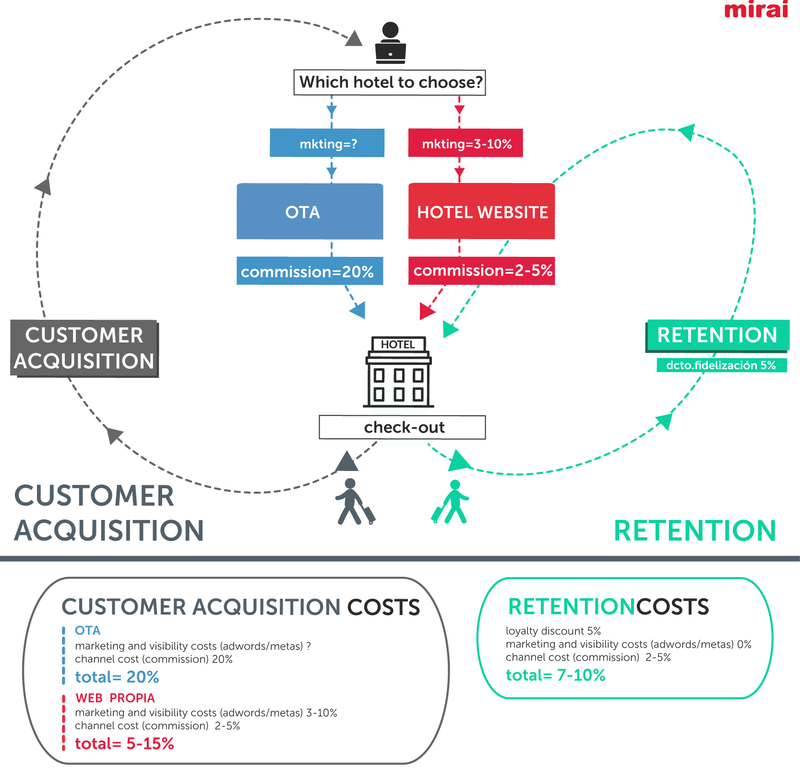 Due to the huge competition between hotels, customer-acquisition costs are constantly increasing, since OTAs use an “auction” system where the hotel who bids the highest has the most visibility (or so they say). The average cost of Booking.com in Europe is of 17-20%, while Expedia’s goes up to 18-22%. On average, we could say that the average cost of OTAs in terms of customer acquisition is 20%. Retaining a client, on the other hand, isn’t so expensive, since the client has already been to your hotel, knows you and, if he liked it, will come back and happily recommend it to others. It doesn’t come at zero cost because you have to have the appropriate tools, dedicate your staff’s time and, in order to make it attractive, offer an exclusive discount. Adding up all of these costs shouldn’t surpass 7-10%. We’re talking about saving 10-13% for each booking if you manage to build customer loyalty through your direct channel. Ironically, many hotels actively participate in programmes which build customer loyalty to the channel such as Booking Genius. It’s like the world has been turned upside down. At Mirai, we openly recommend abandoning the Genius programme in the grand majority of cases. The first booking through an intermediary channel is very welcome. However, successive bookings from that client, and ideally from his friends and acquaintances, should be direct. If you can’t manage that, you’re doing something wrong. Unlike what some people think, when a client wants to return to a hotel where they’ve been, they usually book through the channel they used for the first booking. If it went well, why change? It’s your job to break this cycle, since you’re the only party who wants to make that change happen. On the other hand, you shouldn’t just think about the client’s repetition rate in your hotel but also about the traveller’s repetition rate to your destination, which according different studies reaches 50 or 60% in the following years after their visit. This high number signals a great chance to incentivise many of your clients to return to your hotel, even if it’s in the long term. As we’ve just seen, if you don’t do anything to stop the current trend, you will have no choice but to perennially fight for “new” clients at customer-acquisition costs, even if these are clients who return regularly. In this war, OTAs are extremely comfortable since they almost always have the upper hand because they have everything in their favour: huge marketing budgets (paid by you via commissions), vastly superior technology against which you can’t compete and a “stock and price parity” framework which only penalises you. If you try and break it, you are intimidated by “fear and threats of visibility loss”. Imagine, however, that all your returning clients, who could be 5-40% of the total depending on the hotel, book through the direct channel every time they come to your hotel. How would you feel then? You’d be delighted, of course, because you are going to make considerably more money but also relieved because you will have reduced the increasing dependence on OTAs. Sounds good, doesn’t it? Building customer loyalty without having the appropriate strategy or tools is like trying to run a marathon without having trained for it first; it doesn’t work and you end up getting burned and thinking that running is impossible and not for you. Real conviction to do so. To gather your client’s data during his stay. Tools, even if they are minimal, to store this data. Leave the super-CRM aside for now, even if it’s just for the initial stages (if everything goes well, you will need it further down the line). Knowledge on how to build customer loyalty and which actions to carry out, as well as mid and long-term objectives (3-5 years), never short-term ones. The part where hotels suffer the most today is in the implementation of a professional procedure to collect emails (and of any other data of interest) from their clients. In an ideal world, your channels would provide your client’s email address used for the booking. However, that’s not the case (and they’re well within their own right not to do so), openly accepting their role as “originators” of this first booking and, therefore, allowing you to obtain these details once the client walks through the door of your hotel as your brand-new client. In fact, Booking.com removed this prohibition of contacting the client once he’s in the hotel from their contract back in June 2015. Sadly, it seems that establishing an email-collection procedure (among other data) is complicated, since only a few hotels have it in motion. The main reason is that everything which affects reception-desk operations is complex, slow and requires training. However, it’s an essential step to take and it must be resolved as soon as possible. There are many new ways of collecting emails and other data. During the check-in or check-out process, it’s regular procedure to request these details. You can do it in the classic manner with a simple form or, more amusingly for the client, by handing him an iPad where he/she just has to select the language and introduce their email address. Another more recent alternative which works well is to redirect your clients to a data-collecting webpage once they join the hotel’s Wi-Fi network. On this page, you request their preferred language, email address and room and explain the great advantages of signing up. The good thing about this method is that not only do you acquire the email address of the client who made the booking but also those of all the occupants in the room. Once we have a brand-new email-collection procedure, we come across problem number two: “Where do I store these details?”. The most adequate place to do it is the client’s cardex in the PMS. However, we come across the reality of the PMS world when we realise that, in many cases, there is no room for the new client details. Sometimes, you store them but it’s a slow and complex procedure; on other occasions, you store them but are not able to use them in a quick and automatic way, so there’s not much point in doing it. In order to facilitate customer loyalty through your direct channel, we are waiting for a total revolution in the PMS world which turns them into true CRMs with access to all the information stored on the PMS (stays, restaurant consumptions, preferences, etc.). Sadly, many of these PMS will never make this transition, which in turn forces the hotel to make the difficult decision to change their PMS, something which is always complicated; or to hire an external CRM which connects (in the best of cases) to the PMS in order to check client details. With this basic information, a whole world of opportunities will open up to you if you know how to use it wisely. Trying to define a customer-loyalty strategy in a handful of sentences would be quite audacious. We have listed a few ideas that, at a low cost, would have a high impact. You should focus on these actions so that your client returns to the hotel once you have his details (in other words, once he/she has stayed in your hotel) and not deal with this issue with constant communication during pre-stay, check-in, stay, check-out and post-stay, the latter of which having become highly popular in the marketing world in recent times. Post-stay email thanking the client plus building customer loyalty (with an exclusive discount). Perhaps the client won’t return but he may send it to family and friends, which would also be valid since this is about acquiring new demand for your hotel. Booking-reminder email. Remind your clients that they booked in your hotel a year ago and that you miss them. Perhaps they are weighing up their options again for their holiday and a gesture on your behalf would be the final push. Always verify that they haven’t booked at the hotel already prior to sending the email, because in that case they could cancel and book again at a lower price. Stay-reminder email. It’s nice to know that the hotel where you stayed a year ago remembers you and is offering you something exclusive. Many will ignore it but others may find a way to come to your hotel in the last minute. It may help to fill in blanks in your planning with highly aggressive offers which are always opaque. Segmented campaigns (for type of persons: families, couples, business, etc. or special dates) to boost seasons with a lower occupancy. These are the most commercial actions but they do have their audience and impact. The key is in correct segmentation, since each group has their own preferences and desires. Flash offers for clients who may book on very short notice and who might be tempted with a good offer in the very short term. This will allow you to improve occupancy with a limited price penalty, always in an opaque manner. Maintaining contact with your clients via social networks is always an interesting option, since these allow you to hyper-segment clients by tastes and preferences, much more than those shown in your hotel. There are hundreds of low-cost email marketing tools (less than 100€ per month) which work really well. Choose any of them and use the power of your imagination. At first, it may take some time but once you have your templates and an acquired habit, it will become much easier. All of the above is a process which you can initially do in a simple way and still obtain good results. Once you’ve adopted the customer-loyalty culture through the direct channel, you will need an integrated solution which will allow you to make quick decisions and automatic actions. We are talking about a good PMS or CRM system connected to marketing tools so that you can define actions with ease and the system can do all the work and inform you of the results. This more advanced configuration is more common in medium-size and large hotel chains but not so much in small chains or independent hotels, where this issue is barely dealt with. These are the hotels which have the greatest potential because remember that approximately 65% of hotels in Spain are independent or part of small chains. Building customer loyalty through the direct channel is one of the most important long-term cornerstones in the struggle against OTAs. If you carry on doing nothing, the distance with OTAs will keep on increasing and make things more difficult for you. Remember that nobody can complain about it because they are your clients, to whom you requested their details in a completely legal way. It’s not about wanting it or not wanting it, it’s about money and sustainability. Up until now, intermediaries have been winning this battle by a wide margin. It’s in your hands to turn things around. So true! Well done Pablo! Most of the time is the Time making the difference. Many hoteliers as a matter of fact they do not have enough time and people for building the right strategy for the market.